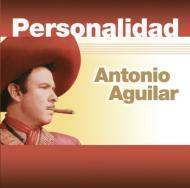 ANTONIO AGUILAR / PERSONALIDAD album from the SONY U.S. LATIN series 20 Antonio Aguilar classics Antonio Aguilar Barraza (17 May 1919 - 19 June 2007) was a Mexican singer, songwriter, film actor, film producer, and screenwriter. During his career, he recorded over 150 albums, which sold 25 million copies, and participated in more than 120 films. He was given the honorific nickname El Charro de M騙ico (The Horseman of Mexico) because he is credited with popularizing la charrer�}, considered to have originated in Mexico, to international audiences.